STATE CASEWORKER VIOLATING ONE'S RIGHT TO CHILD,AND OR GRANDCHILD. FEDERAL COURT SHALL BE YOUR REMEDY TO SUE. "When your attempting to hire lawyer to sue for you"
horribly abused in foster care/under state supervision. Follow,hence your suit and notice of intent(notice of claim;tort notice)timely. 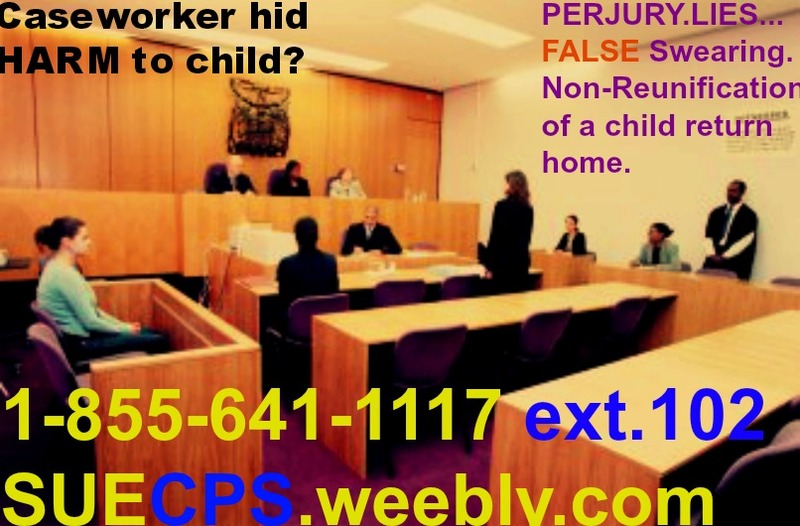 per civil right violation re:cps. Time is strictly limited. .FILL OUT CONTACT/Help page to begin. The Help/Contact Page is below,for your convienience. Thank you . . . ext.102. FALSE SWEARING TO THE"ACTUAL FACTS"of what a caseworker allege-to have observed. FABRICATION, all allow YOU THE INNOCENT,TO TIMELY SUE. (LAWYER NOT SUING? )file pro-se,DO NOT MISS DEADLINE,when your able to sue pro-se,timely CPS. Heather-Marie is highly referred,weekly to those who are looking nationally to file a suit against DFPS,DCFS,OCS,DYFS,DCCP,ACS CHILD PROTECTION CASEWORKER who are continually undermining such loving bond with GOOD American Parent and child wrongfully being detained,and or removed.BellasLAWStudentsParalegal and certified-staff,with combine expertise involving inequities exerted by CPS 15yrs. allow such professionalism,rarity to be issued,per consult from first call.Your able to feel such sincerity,openess,astute mind when it come to "how to sue pro-se cps." and her direct ext is 102. Our site unlike ALL OTHERS,are publicly supported for YEARS,by attorney(s)for are who we receive,free input from,when your suing pro-se cps.Be sure to begin same-day before deadline to sue,just fill out the CONTACT FORM FOUND BELOW. Thank you. ext.102 heather-marie. Your to immediately fill-out submission help-form below. Then call in to ensure your help request form was properly received.